Despite market concerns and artificial price suppression, Micron's stock refuses to fall. Micron's management is responding to the market concerns responsibly. The company is seemingly obsessed with its nearly flawless balance sheet, and reducing inventory glut can be seen in a positive light, in this respect. We look into management sentiment via financial lexical analysis and provide an appropriate options strategy for Micron. In January, I gave an options strategy for Micron (MU) that would yield more profit than holding the stock should MU rise above $34 by mid-February. I received a request for another such options strategy on MU for the current quarter. Today, we are going to look at such a play. Let’s start things off with noting that MU has artificial downward pressure via naked shorts. 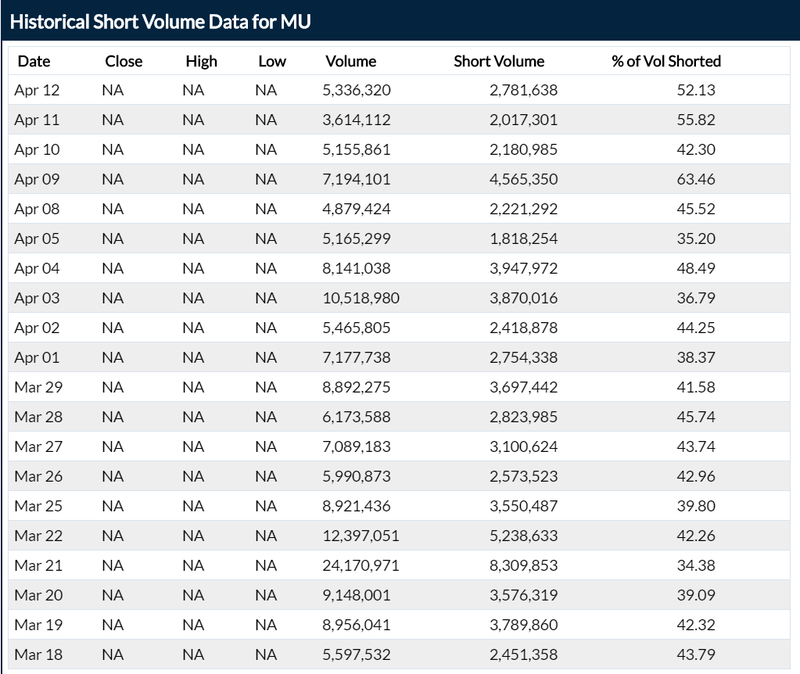 While short volume is way down post-earnings (8M to 2M in volume), naked shorts have jumped from 33% of the short volume to over 50%. Nonetheless, this artificial price suppression has not caused MU to fall but merely stall. Nor have the concerns regarding DRAM supply and demand driven MU’s stock price downward. As Micron is attempting to reduce its inventory glut in response to the DRAM “bear market,” some investors and analysts are claiming Micron will see trouble, which will lead to a drop in the stock price. But from a business perspective, Micron is acting appropriately, as the economy is entering a slowdown phase to which the proper response is to slow down production. With the macro environment and short pressure not denting MU’s price-per-share, it seems silly to expect MU to drop suddenly and significantly from here. While DRAM prices are dropping, this is likely due to manufacturers attempting to liquidate, as doing so would be preferable to an inventory glut. This is balance sheet repair and is also not a bad thing, as it shows a company’s informed response to macro/economic changes. As earnings were recently posted, we should dive into them, looking for changes in management sentiment. From financial lexical analysis studies, we know that management sentiment provides orthogonal data to stock prediction methodologies and proves useful in helping predict the direction of a stock’s price in the coming quarter. I looked into MU’s earnings calls with my own lexical analysis algorithm. My finding was that sentiment was slightly lower than average (13% below average). The quarter-to-quarter change was negligible, implying that management has not seen or felt any large changes in the company’s direction. However, the year-to-year change in sentiment is significant, with this Q2 2019 showing a 43% drop in (optimistic) sentiment versus Q2 2018. The macro situation might look bearish for now, at least in terms of DRAM, but Micron is optimistic moving forward due to the requirements of the changing end-market environment. While the big discussion at the moment is DRAM supply, NAND is also experiencing a supply issue. Micron makes this clear but implies that the reason is a changing market and thus likely temporary. The transition to 5G will likely change the supply/demand curve via increased and sustainable demand as early as 2020. While the company deals with inventory issues, it is also not overly worried about the temporary macro change. Management considers Micron well-positioned to continue growing, in part due to its nearly flawless balance sheet. Overall, while we did see a significant drop in positive sentiment, annually, management seems to be optimistic about the future of Micron, despite intermediate market concerns. The economy is entering a slowdown phase, and the DRAM as well as NAND markets are undergoing transitions. Nevertheless, Micron remains healthy and aims for continued growth, making it a strong and safe pick for a long-term holding in the memory chip industry. Our last trade on Micron was a near-term trade that looked to manipulate the risk/reward curve for the sake of excess returns. At present, due to market concerns, I do not see the same options strategy being ideal. Instead, simply holding Micron should give excess returns because of the risk premium that comes with industry concerns. The downside of this play is that MU holders will not see any additional profit should MU rise above $42.50 by May 3. However, this play is essentially free in that the prices of the two options above are roughly at parity. The ideal situation is MU rising to exactly $42.50 by May 3, in which case you gain additional income through the short call and/or two weeks of downside protection, depending on whether you decide to sell back the put. My thesis on MU is that it will either pull back slightly or trade flat. 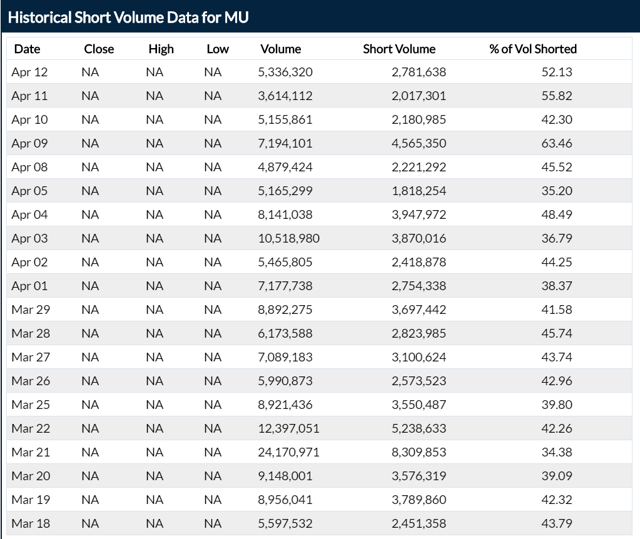 When the shorts unravel and the market sentiment improves, MU will continue its upward trend, rewarding investors who took on the additional (perceived) risk in staying long. Hence, this time we are not going with an aggressively bullish options strategy and instead simply going long stock, but with downside protection so as to convert the risk/reward curve to one more favorable for the current conditions of MU, its industry, and the general economy.